7 weeks today. The most notable development this week was daily nausea, and more of it. I get motion sickness very easily anyway, so this was one symptom I was definitely expecting. Except for Tuesday, though, it hasn't been too bad - just a few waves of nausea throughout the day, which triggers me to a) put on my Seabands, and b) eat some pretzels. I learned pretty quickly not to mess around with my eating schedule, since Tuesday (my late day at work with a standing 5pm meeting) I ended up feeling so wretched it took me over an hour to get through half a baked potato and a can of ginger ale. I thought I had kept up with the snacking, but after getting stuck in some stop-and-go traffic on the way home, I found myself contemplating if it would be messier to throw up in my lunch bag or out the car window. Luckily it didn't come to that, but I was miserable and beginning to regret tempting fate by reveling in any pregnancy symptom I could come up with. The next morning, I was already down by a couple of pounds, which was a bit concerning, but with a better handle on eating as soon as I feel any amount of nausea or light-headedness, I went right back up to my normal weight. I also had more sensitivity to smell this week, which probably didn't help with the nausea issues, and besides a fit of absolute rage last week, I've been pretty steady emotionally. In fact, I'm even starting to feel a bit more comfortable with this pregnancy, which is a little silly since I'm still so early, but really, no matter how much worrying I do it won't change the outcome anyway. So I've decided if I want to believe that this pregnancy is going to last through the end, I'm not going to try to discourage myself from taking comfort in that. 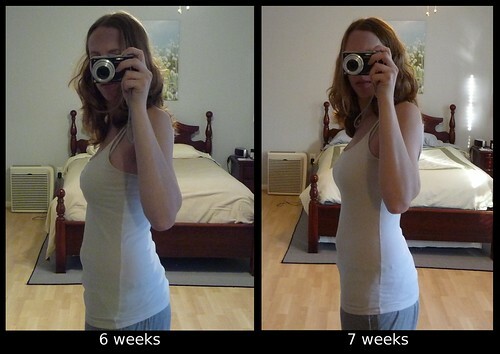 Not too much difference in this week's comparison picture, although it does look like the bloat has gone down a bit.